This unique dreamcatcher is woven around a four point deer antler. 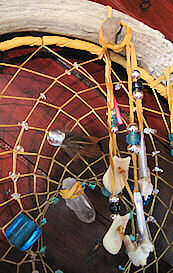 The hoop is 12" in diameter (30.48cm) and overall this dreamcatcher is approximately 31 inches long (78.74cm). The largest antler tine has a length of about 6 inches to 10 inches (15.24cm to 25.4cm). The exact length of the tines will vary with each antler. You can choose your leather color (shown in Gold Buckskin) and the small semi-precious stones used in the web (shown with turquoise and clear quartz), and whether you want brass or silver beads and cones. If you have a color preference for the crow beads on the fringes, leave a comment in the comment box on your checkout form. 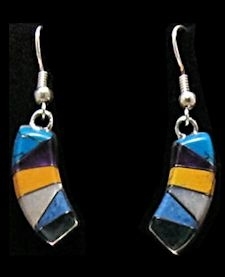 We have these crow bead colors. 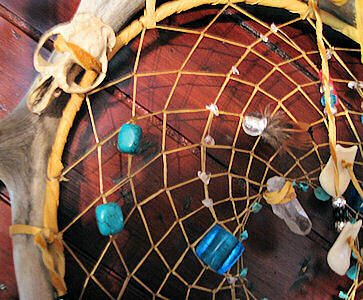 This specialty one-of-a-kind dreamcatcher has all kinds of trinkets. There are 7 real buffalo teeth and 7 real deer dew claws. There's also a real muskrat skull and a real coyote tail. It has brightly colored Golden Pheasant feathers that are tipped with brillian gold, red, and green plumage. They are held on with your choice of silver or brass colored cones, and there are two faux elk ivories (teeth). There are also two real coyote teeth. There is a big 1 1/4 inch piece of red coral in the web and many small turquoise nuggets surrounding the opening in the center of the web (or whatever semi-precious stone you choose), and many glass trade beads in the web. Long pheasant tail feathers and a wild turkey tail feather extend to the bottom of the fringes below the web. Inside the opening at the center of the web, a large clear quartz crystal dangles. There is a second large crystal on the side of the dreamcatcher and one or more 3/4" turquoise nuggets. 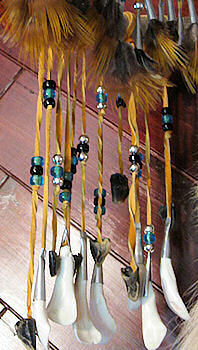 The bottom and right side of this dreamcather has dozens of long deerskin fringes and are decorated with glass crow trade beads, brass or silver plated beads, and are tipped with brass or silver colored metal cones. 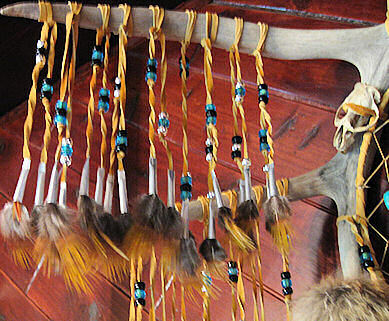 This antler dreamcatcher was handcrafted in the USA. It is a one-of-a kind piece--the one pictured is representative of the one you will receive, but may vary slightly. We make this dream catcher when you order it so we can customize it the way you want it, so allow one to two weeks for construction time. This dreamcatcher can be shipped internationally. However, check to be sure these animal parts and farm raised pheasant feathers can be imported to your country. We are not responsible for items seized by customs agents. Feathers of any kind cannot be shipped to New Zealand, however, we can remove the feathers upon request. There are also restrictions on some of these animal parts in some states in the continental US. Muskrat skulls are illegal in Wisconsin. Deer parts cannot be imported from out of state to the states of New York, New Jersey, or Maryland. There may be restrictions in other states, so if you aren't sure, check with your local Fish and Game Dept before ordering. This product was added to our catalog on 09/27/2011.